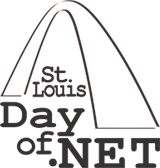 The St. Louis .NET User Group is proud to announce that registration for the St. Louis Days of .NET 2012 is now open! The conference will once again be held at the Ameristar in St. Charles, Missouri, on August 2-4, 2012. The “early bird” price of $175 per person will be available through June 30. You are going to want to ACT FAST THIS YEAR – due to our ever-growing demand and our desire to fit within our venue, we have had to cap our capacity with only 900 available tickets! To celebrate our fifth year, we have a number of exciting changes in store. There is now an optional THIRD DAY of content. For an additional $75, you can come out on Thursday (August 2) and spend a full 8-hour day in a deep and focused dive into one of a handful of new and upcoming technologies and practices. The main conference session will, as usual, take place on Friday and Saturday. In addition, we have a number of great social events planned, both Thursday and Friday evenings. We also have events for the spouses of attendees too! Meet your peers, make connections, have great discussions with industry leaders and luminaries. From start to finish, we look forward to bringing you our best and most exciting conference yet! Remember to spread the word – tell your friends and colleagues to register as soon as they can! And lastly, we still have great opportunities available to become more involved. We continue to review speaker submissions for those interested in presenting. Or if your company wants to get its name out there, we have still have a few remaining sponsorship opportunities. Check out our website (www.stldodn.com) for more information, or email us. Register today! You are encouraged to tweet, blog, or otherwise help spread the word!